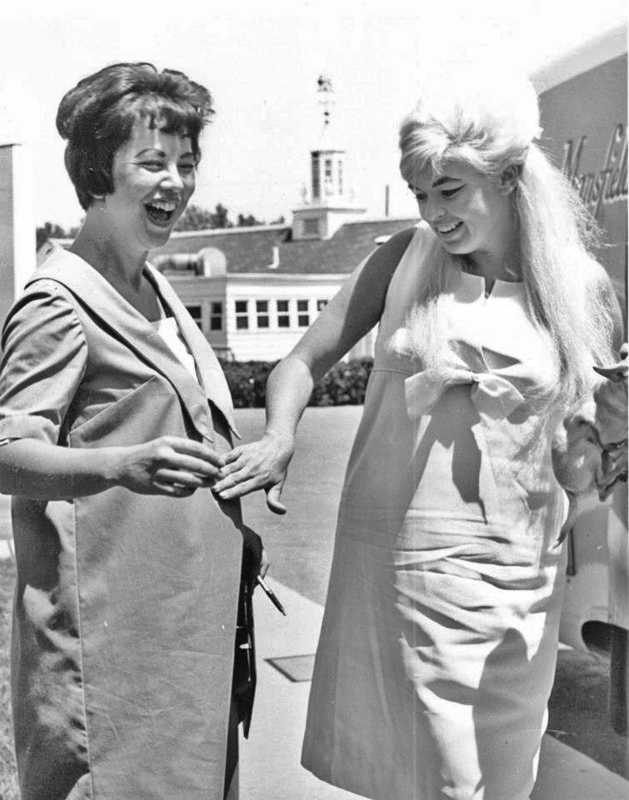 Actress Jayne Mansfield, right, feels the belly of pregnant reporter Gail Tabor in 1965 in Columbus, Ohio. My dead mother is more successful on the Internet than I am. It happened Thursday. She had a little help. But that doesn’t lessen my bemusement. It only seems to show how capricious the online audience is and how difficult it can be for a writer to be heard in the digital cacophony of the Internet. I’m a second-generation journalist. My mother, Gail Tabor, was a reporter for the Citizen-Journal in Columbus, Ohio, when she met my father, Steve Lucas, who was pursuing a PhD in business at Ohio State. She kept reporting right up through her pregnancy with me. She left reporting when she had me, but 12 or 15 years later, after her divorce and a move to Phoenix, Arizona, she got a job at the Arizona Republic. She worked as a features reporter, fashion editor, gossip columnist and news reporter, in roughly that order, until being forced into early retirement in the mid-1990s. At the time she left the newspaper, the Internet was barely a thing most people had even heard of, and like most people she didn’t own a computer. A few years after she retired, I took a job in Richmond, Virginia, that among other things called for me to be a daily advocate to the company’s newspaper editors for adopting various “new media” practices – video, blogs, social media, and on and on. As part of that work, I started a blog nearly 10 years ago devoted to those things. The original blog was behind a company firewall and couldn’t be viewed by the larger world of the Internet, but in 2011 I migrated it here to WordPress. Earlier in 2012, my mother died. Among her things were a good many of her newspaper stories and columns. One was a column she wrote in 1983 about a candy treat called Buckeye balls, which are rolled peanut butter balls dipped in chocolate, but not totally covered in chocolate so they look like Ohio buckeye nuts. Making Buckeye balls was a fall tradition for my family, usually done on the day of the Ohio State-Michigan game. I loved that column and typed it, in its entirety, into a post on my blog. Over time, that post became the second-best-read item on my blog. Pretty much every day, at least a couple of people searched the Internet for “buckeye balls,” “buckeye candies” or some variation and followed a link to that post. And then on Thursday a slideshow online called United States of Food: Official State Foods mentioned “buckeye candies” in its Ohio entry and linked to my mother’s column on my blog. The traffic blew away my previous one-day record. So now my mother, who never blogged a day in her life, has both the best-read post on my blog and the biggest single-day audience. If it were anyone but Mom, I’d be upset. My mother, who has been dead three years and never lived in Lenoir, received an offer in the mail at my house this week to get a free hearing exam. “You have received this invitation today because you best represent the segment of the population which is most likely to experience hearing loss and tinnitus,” it said. I would not have thought of the dead as the segment of the population most likely to suffer from hearing loss, but in hindsight I should have known better. If nothing else, all the dirt muffling sounds from the surface would make that person keenly aware of how much better his hearing could be. Anyway, my mother was cremated. Surely that process cleared up any problems with her ears. But as I thought about it I realized there are other possibilities. What if the afterlife is more like the Catholics envision it, or used to (do they still believe in limbo and purgatory? ), and when you die it isn’t a clear-cut case of going to heaven or hell? There could be intermediate steps. Maybe not limbo as the Catholic church described it, but something hung in the middle between heaven and hell. My mother lived a good life and was kind to helpless animals, but she was no saint — she was a journalist, after all — so perhaps she escaped hell but is condemned to an eternity of tinnitus, a constant ringing sensation in the ears. It would be like the afterlife was portrayed in the comedy-horror movie “An American Werewolf in London,” where the victims of a werewolf are cursed souls and must roam the earth as ghosts until the werewolf’s blood line is severed. This would make being bitten by the journalism bug a curse similar to being bitten by a werewolf. (If you don’t think being a journalist is a curse, come spend a day with my boss.) I’m sure this idea would strike any journalist as uncomfortably familiar in the same way as looking into a mirror at a big, formal gathering and seeing yourself with a severe case of bedhead. Except in the movie, the ghosts of the werewolf’s victims looked just like their physical corpses – bloodied and mauled, and gradually decaying. In the case of the cursed journalist, the ghost would walk the earth forever, constantly sticking a finger in his ear and wiggling it, or lying in bed in the dark trying to ignore the ringing. And of course, the curse for a journalist is doubled because the dead can’t drink. I can see it now, and probably will the next time I belly up to a bar. I’ll look down at the row of seats and imagine dead journalists at each one, all looking longingly at my beer while they wiggle an index finger in their ears. All except Mom. She was a scotch drinker.